There are two types of people in the world, cake people and pie people. I used to be one of those wishy-washy-straddling-the-fence people who tried to claim both, but the truth is, when really pressed, the pie wins out in almost every category. I mean there aren't that many flaky buttery crusts on cakes. You can't fill a cake with anything from fruit to mushrooms and know it's going to be be amazing. And cakes do not respond nearly as well to the amazing whipped toppings specially reserved for pies. Besides, cakes are so strict and fussy. Pies let you have a little more wiggle room, and freedom without having to worry so much about whether or not you used the exact right amount of baking powder, you know? So, yeah, I am officially claiming to be a pie person. Pie rules. Especially the pies that Dynise is serving up in her new book, Pies and Tarts with Heart. 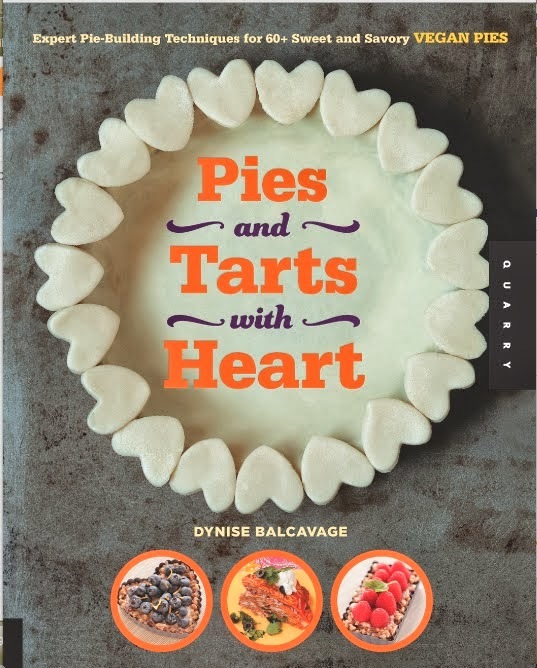 Pies and Tarts with Heart is Dynise's third book, and it is beautiful. From cover to cover this book is smartly laid out with amazing full color photos, adorable fonts, a very user friendly index, a table of contents that lists every single recipe (I love this!) and recipes that are laid out so there is no annoying page flipping in the middle of a recipe. The recipes are also designated as being gluten free, fast, low-fat, kid-friendly, raw, or no-bake with little icons right next to the recipe title making it really easy to pick a recipe that fits just about any need. Then come the pies. A lot of pies. 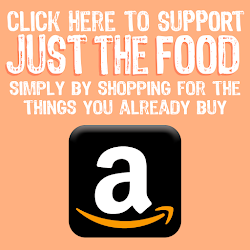 Traditional Pies (apple, pumpkin), Creamy Pies (banana, butterscotch), Citrus Pies (key lime, lemon fluff), Raw Pies (blueberry cream, raspberry chia), Nutty Pies (pecan, rocky road), Arty Tarts (plum, cranberry), Savory Pies (tomato, cheeseburger!!! ), and even Imposter Pies (whoopie and shepherd's). Just to name a few! She finishes the book off with a chapter on pie toppers...whipped toppings and sauces to take your pie to the next level. One of my favorite things about this book is how fun it is to read. Dynise's writing style is smart and a tad sassy. 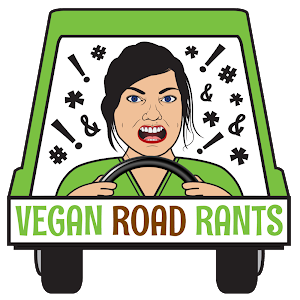 Her personality certainly shines through in her writing and I particularly enjoyed a mini rant in the beginning of the book about use of the word "vegan." She definitely got me thinking about more than just pie! Another wonderful feature in this book is Dynise's obvious love for experimentation in the kitchen. She will give a base recipe and often offer up 10 different variations. I love that. Personally, I don't love (ore really even like) to follow recipes, so when I see a cookbook author make a point to let the reader know that it's okay to vary from the written word, it makes me a very happy camper. 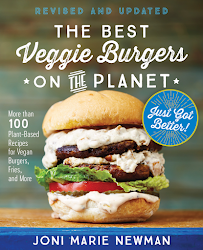 Overall this book is a must have for any pie lover, vegan or otherwise. The recipes are so solid, and as I stated before, the book is just gorgeous. With some fairly pie friendly holidays, just right around the corner, it would be a good idea to pick this book up soon so you are armed and ready. The fine folks over at Quarry Books have offered to give a copy of this awesome book to one lucky blog reader. Simply follow the prompts in the widget below to enter. Open to US residents only. Now, for some pie! 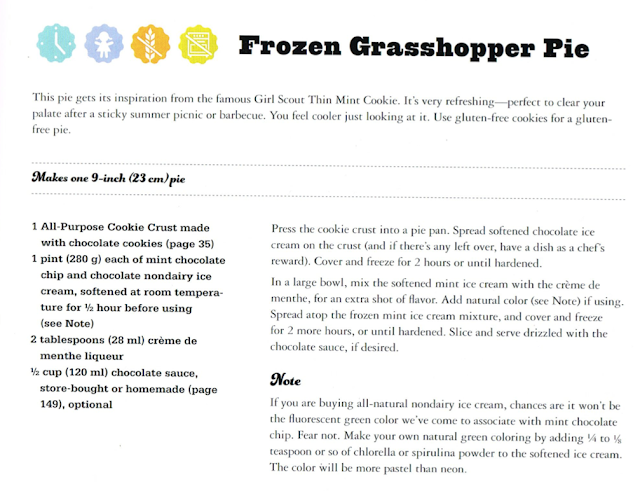 Dynise was kind enough to allow me to share her recipe for Frozen Grasshopper Pie (page 67.) I chose this dessert for several reasons. Because I love the drink; A typical grasshopper cocktail consists of equal parts green Crème de menthe, white Crème de cacao and fresh cream (nondairy of course! ), shaken with ice and strained into a chilled cocktail glass. Because a while back I created my own version of this pie, (which appears in Home Cooked Vegan Comfort Food), so I really wanted to try Dynise's frozen version. And because it's really, really easy to make! No baking required...now that's my kinda birthday pie. So how was it? Fantastic! Super minty and cool. 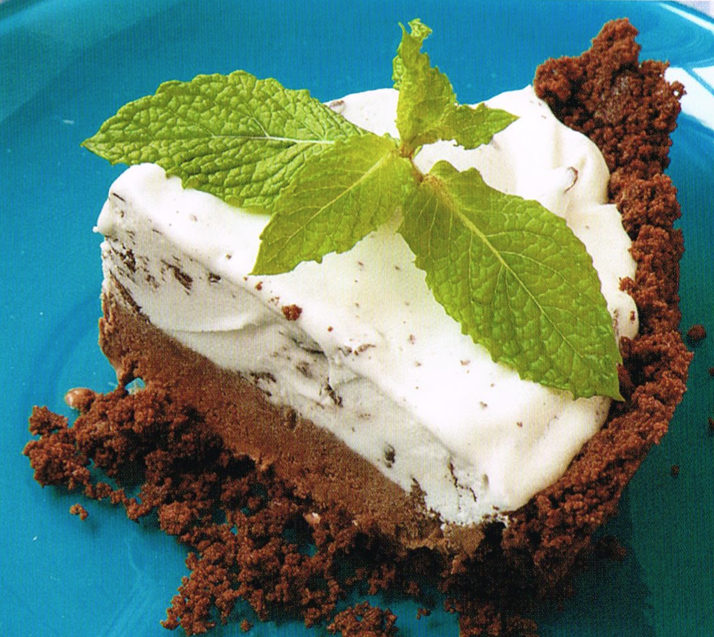 Super perfect interpretation of the cocktail with a perfectly crumbly chocolate cookie crust. (C) 2013 by Quarry Books and Dynise Balcavage. Lemon Meringue is my favorite type of pie. I love me some classic strawberry rhubarb. Happy Birthday! Frozen Grasshopper Pie is definitely a birthday-worthy treat and that slice looks superyumful! I'm a hard-core pie person too and lemon blueberry pie with a shortbread crust is my life-long favorite. Cheers! Happy Birthday!!! Favorite pie?! Yikes "Quiche", strawberry rhubarb, samosa pot pie? Too many to chose ! PUMPKIN PIE ALL THE WAY and Happy Birthday. and wishing you everything that brings you happiness today and always.